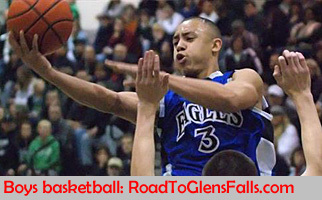 Leading off today: West Genesee saw most of its 12-point lead evaporate in the closing minutes but held on for a 59-57 win over Niagara Falls on Friday in the NYSPHSAA boys Class AA basketball semifinals in Binghamton. Will Amica led the Wildcats with 15 points. Lucas Sutherland recorded a double-double with 10 points, 10 rebounds, and Jack McLane provided a spark off the bench with 10 points and 12 rebounds. "We knew they were going to make a run," West Genesee coach Fred Kent said. "We've been hanging on for the past couple games. It hasn't been pretty but we've made enough plays to continue playing." Niagara Falls guard Josiah Harris drilled back-to-back 3-pointers to cut West Genesee's lead to one late in the fourth quarter. On the next possession, Harris missed a 3-pointer, leading to two missed free throws by McLane. After Niagara Falls failed to score, McLane was fouled again. He made the second free throw to close out the scoring. "It was crazy, my heart was beating so hard," Amica said. "We knew we had size and we knew we could use it to our advantage to get the win." West Genesee will play in Saturday's championship game against Brentwood, a 74-63 victor over Kingston as junior Bryce Harris connected for 26 points. "During shootaround, the stroke felt good and everything felt like it was going in," Harris said. "It translated into the game, and when my team told me that I made a big difference during the game, that was incredible." Harris, Kenny Lazo and Jordan Riley were a combined 12-for-14 from the free-throw line in the final 3:11. Class A: Daniel Cook continued his outstanding postseason with a 38-point, 19-rebound performance, leading Pittsford Mendon to a 92-67 rout of Troy in their semifinal at Floyd L. Maines Arena. The big effort came six days after the 6-foot-6 senior put up 32 points and 15 rebounds in the quarterfinals for the unbeaten Vikings. Cook's three-point play moved the Vikings ahead 13-6 but Troy fought back to forge a 17-17 tie. The teams went back-and-forth to start the second quarter as Latyce Fasion of Troy and Michael Harrington (14 points) exchanged 3-pointers that made the score 27-23 in Mendon's favor. From there, the Vikings went on a 12-4 run as Harrington and Connor Krapf scored back-to-back driving layups. Cook added a 3-pointer later to give Mendon a 42-31 lead at halftime. "They're just clicking on all cylinders, one thing I have to say with these winter seasons being so long, teams can get tired and worn down. These guys are getting more and more energy as we go along," Mendon coach Bob Nally said. "They do not want the season to end, I've never seen a team as locked in as these guys." Mendon's opponent in the final will be Poughkeepsie, a 74-63 winner against Manhasset. Poughkeepsie, which last won a state championship in 1995, placed six scorers in double figures. The Pioneers' were led by a game-high 21 points from Davontrey Thomas. The forward hit five 3-pointers and added 10 rebounds. The game wasn't in hand until Jaquan Pearson's breakaway dunk with under a minute remaining. Prior to that, every time Poughkeepsie was primed to make a run and pull away, the Indians responded. shooting teams, good shooting players are going to make shots whether you put up a hand or not. Fortunately, we were able to bother more shots in the second half." Class B: Joe Girard III lead Glens Falls with 39 points, 13 rebounds and nine assists in an 83-63 victory over Olean to kick off the day's schedule of six games in Binghamton. Girard's day began with his repeat selection as Gatorade's New York player of the year. "All the individual accolades are great but if you can win a state championship with your team, brothers, and family than there is nothing like it," Girard said. "So I am looking forward to playing tomorrow and hopefully getting one." Girard hit for 16 points in the first quarter and six 3-pointers in the first half as the Indians, who lost state finals in 2003 and '07, slowly pulled away. Lowville pulled off the surprise of the day in reaching the final. It's not that the Red Raiders aren't worthy, but rather than Center Moriches had been slicing through Long Island competition so impressively this past month. Hudson White hit back-to-back-to-back corner 3-pointers and four overall in the third period to account for all of his points as Lowville pulled away to an 80-68 victory in a game the Red Raiders led virtually start to finish. Gavin Macaulay led the winners with 25 points and Aidan Macaulay had 19. Anastasia retires: Olean coach Jeff Anastasia confirmed he is sticking to his long-known plan to retire. "I can't even tell you how hard it is to say this is it," said Anastasia, 60. The 600-game winner was the head coach for 32 seasons and won a pair of NYSPHSAA titles with the Huskies. "Sometimes that storybook ending doesn't happen," he said. "But the memories are all there of this season. Nothing but great memories."